PITTSBURGH, PA – Arsenal FC of PA are pleased to announce that Admiral, the Original British Football brand to American and England’s top teams, will be the official uniform supplier to the club beginning in the October 2012. Arsenal FC has a high quality youth soccer program with 36 teams and over 600 players in Pittsburgh. “We’re delighted to be launching Admiral with Arsenal FC." says Paul Hamburger, President and CEO of Admiral Soccer. “Admiral is totally focused on supporting the needs of community soccer teams throughout the United States. We’re really looking forward to working with the club’s players, coaches and the local soccer community.” says Hamburger. Arsenal FC are planning to have over 1,000 players within the next couple of years. They are well on their way to this target with the recent partnership with AC Atletico Soccer Academy based out of the East of Pittsburgh, which adds quality girl’s teams to the club. The club has 20 boys and 17 girls teams from U7-U18. The club has also entered a partnership with West Ham United of the EPL to provide coaching and mentoring together with other best practice programs. Arsenal FC President, Mark Taylor commented: “We were recommended to work with Admiral by our partners at AC Atletico. 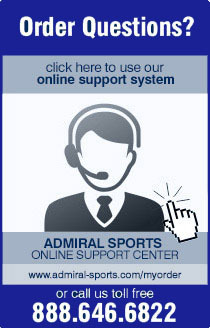 Admiral have been really supportive, providing a custom kit, reliable service and really competitive pricing. The brand has lots of credibility in soccer too. West Ham winning the FA Cup in Admiral, lets hope they bring us similar success with our teams!”. The club will unveil their new Admiral kit in the next couple of months. About Admiral; Admiral, founded in 1914, first began manufacturing sportswear in 1966, when England won the World Cup. The company was a pioneer of the replica kit market, creating home and away kits for England, Leeds United, Manchester United, Tottenham Hotspur, West Ham and many other teams. They expanded overseas to the US supplying New York Cosmos, Tampa Bay, Vancouver Whitecaps and others in, Canada and Latin America. Admiral designs, manufactures, markets and distributes team wear, leisure apparel and accessories. For more information on Arsenal FC of PA including sponsorships, tryouts or to volunteer, visit http://www.arsenalsoccerpa.org/ or call 724-747-1650.